Tech Tyres Ltd began trading back in 2001; however we have over 30 years of experience within the motor industry. We welcome customers from all around York and the surrounding areas, with no task being too large or small for us to complete. 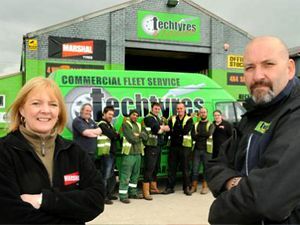 Originally, Tech Tyres Ltd solely operated as a tyre dealer servicing commercial fleets in the local areas. Due to expanding into larger premises within the last five years we are now able to provide a complete auto-care service all under one roof. This adds servicing exhausts, brakes, mechanical repairs, fault finding and diagnostics to the business. We continue to service commercial fleets and a variety of local businesses as well as taking on the retail customer. We have increased our fitting bays from 4 to 10 and now employ 12 staff who are hand-picked and highly trained, with each having many years timed served experience within the industry. The business has expanded quickly with repeat and new business due to recommendations through word of mouth. As well as our tyre and mechanical service bays, we now have our own MOT station and a spray shop, which covers full body repairs and alloy wheel repairs and wheel refurbishment. We have also opened a new valeting bay too making us a one stop shop for all your tyre and auto-care needs. We are still able to give independent advice and guidance with competitive rates. As a family run business we like to think both our staff and customer's past and present as family too. So if you like what you read and would like us to help with any aspect of vehicle maintenance, servicing or provide an MOT inspection, please don't hesitate to contact us today on 01904 409 795. You can also get in touch with our garage to arrange servicing and MOTs by visiting our garage, calling us on 01904 409 795 or through our email contact form. So whether you need help with car servicing, accident repairs or a new set of tyres in York and the surrounding areas, we're just a phone call away!